What’s your shop’s name inspired by? Is it the Yiddish phrase? Yep! The name Kenahora is taken from the Yiddish phrase, which is essentially a Yiddish/Hebrew slang mash up for “kein ayin hara,” or, “no evil eye.” It’s used like a knock-on-wood saying, as to not jinx the good fortune of which you just spoke. Most of my work is inspired by my Jewish background, specifically in folk magick and lore. I picked the name while talking to a friend about our grandmothers, and looking back fondly on quirky old Jewish lady behavior. 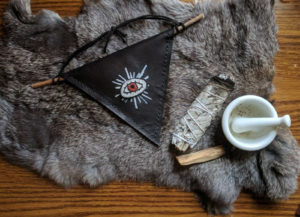 What are your fave uses for the ritual oil? I will put a few droppers full of the Absolution oil in my bath before any kind of spell work for cleansing, which I like to do before stepping into my ritual space, physically or mentally. I then massage myself with another oil, tailored to whatever the spell is for. If you’re familiar with candle dressing,I basically dress myself like a candle, working out from the heart for banishing or evocation, and towards the heart for manifesting or invocation. With all of that said, sometimes I just like moisturize and smell good so I use it after the shower to lock in moisture in these dry New England winters. You can use it to add little bits of magick to your day, without committing to full on spell work. Which symbols inspire you the most? At the risk of being unoriginal, I love the hamsa. I love hands and hand art in general. But to be honest, the answer to this could change daily. Sigils and symbols are huge in my spiritual practice, and most religions and cultures have symbols and iconography that is beautiful and inspiring. She’s just too cool! Not an ancient evil, but an ancient neutral. Maybe she’ll help you out, maybe she’ll mess with you for fun. Maybe there’s three of her. 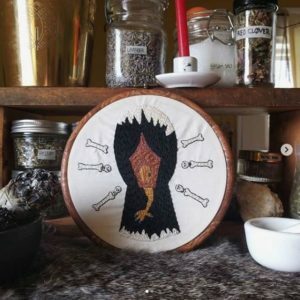 The embroidery features her home, a hut on a chicken’s leg, surrounded by a fence made of bones. It’s one of my more detailed hoops, which I am trying to make more often. What’s your fave piece to give as a gift? It’s hard to pick! Probably the leather wall amulets. I usually have a dreamwork amulet and a “happy home” amulet available ready-made, but I do custom amulets, as well. I’ve had people buy them as wedding gifts, but I think they’re great to give to anyone you are about. 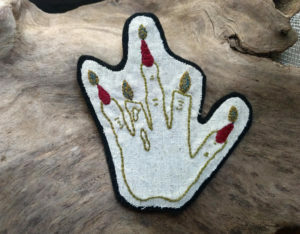 Also, the hand of glory patches. They’re just really funky, a tiny bit nefarious, and seem to be a popular item people buy for gifting. Visit Claire’s booth and maaaaaaaany others this Sunday at the Cambridge Community Center!